Told by TeAta. Adapted by Lynn Moroney. Illustrated by Mira Reisberg. Published by Children's Book Press now Lee and Low. Loveable but naughty Baby Rattlesnake throws tantrums to get his rattle before he's ready for it, misuses it, gets in big trouble and learns his lesson. - A Chickasaw teaching tale. A featured Sesame Street Read-A-Long. Recommended by the Elementary School Library Collection. Kirkus: "Attractively illustrated in sophisticated desert colors, the bold designs framed in imaginative borders, incorporate Native American motifs." Publishers Weekly: "Reisberg's vivid fanciful illustrations perfectly depict the Southwestern setting: the many comical touches include a derby sporting father and a heavily made-up mother. The paintings' sparkling borders make splendid use of regional flora and fauna." The Reading Teacher: "The illustrations are bright and clever, especially the way the snakes' faces and patterns vary according to age and gender. Humorous and warm." Children's House/Children's World: "Using brightly colored paper and gouache paints, the baby rattlesnake and his family are as loveable as Dino the Dinosaur." The Bloomsbury Review "The artwork dances on the page with bright colors, visual puns and pleasing shapes: this is the kind of book to delight both children and older folks who have the privilege to introduce the tale over and over again." Books of the Southwest: "With great illustrations that make rattlesnakes' markings into colorful contemporary designs." The Mecklenburg Gazette "Artist Veg Reisberg portrays a loveable, but spunky fellow. Her portrait of a father sporting a derby hat, and mother complete with ruby-red lips, is endearing. Try not to smile as they envelop their little one in a heart-shaped, snakey hug." San Francisco Chronicle: "Reisberg's gouache paints and cut paper cunningly adapt Southwest Indian art traditions. The vigorous bold colors and patterns appear nearly three dimensional so much so that in places, you could just reach out and touch the sand." Adapted by Harriet Rohmer. Illustrated by Mira Reisberg. Published by Children's Book Press now Lee and Low. Uncle Nacho's hat no longer works. It's full of holes and falling apart. In this Nicaraguan folk tale about the difficulties of change, Uncle Nacho's niece Ambrosia helps him find a place for the old and the new. UNICEF - Ezra Jack Keats Award Citation. Kirkus: "Appropriately illustrated in bold colors and stylized forms that recall Central American folk art." Horn Book Magazine: "with vibrant illustrations in full color, will encourage discussion and delight children." Books of the SouthWest: "Delightful colorful illustrations face brief pages of text in both English and Spanish"
Written by Lucha Corpi. Illustrated by Mira Reisberg. Published by Children's Book Press now Lee and Low. Lucha Corpi tells a beautiful, lyrical, intriguing and funny story about her childhood in Jaltipan, a small tropical town in Mexico.Full of adventure, mystery, ghosts and revolutionaries. The story is most of all about the warmth and security of family love while finding your destiny. Texas Bluebonnet Masterlist Award (Texas Library Association). Kirkus: "It's a wonderful evocation of the early experiences and family love that give a child both roots and wings…. In the intensely tropical-colored paintings, cats are purple, memories are turquoise, and a many-hued bus announces that its destination is "El Mundo" ("The World")." Booklist: "Bold cheery illustrations will help attract readers to the unusually sophisticated (though still accessible) text." School Library Journal: "Reisberg's brilliantly colored, primitive illustrations and arresting borders add immeasurably to the sense of place. This is a sure winner for storytimes." Written by Lynn Moroney. Illustrated by Mira Reisberg. Published by Children's Book Press now Lee and Low. This adaptation of an early Estonian creation story tells about Elinda's love for Prince Borealis of the Northern Lights while educating about diverse planets and sky lore. Recommended by the Elementary School Library Collection. Publishers Weekly: "The highly stylized art dramatic in its colors, patterns and evocation of fairy tale Eastern Europe further enhances the story's appeal." Kirkus: "The story is illustrated with sturdy forms and bright colors that pay homage to its traditional origins." Bookwatch: "Reisberg's color drawings enhance this gentle story of love." Children's Advocate "Sarito Pinto says she likes the vivid pictures because there is a lot of detail in them." Focus "Reisberg has dressed the book's pages in the bright colors of traditional Estonian crafts. Elinda's clothing is typically Eastern European, as are details of daily life, like the good luck stork who feeds the new born goddess. Fantastic representations of the Sun, Moon and other celestial visitors will also captivate young reader." Written by Elizabeth Miller. Translated by Theresa Mawler. Illustrated by Mira Reisberg. Published by Albert Whitman and Co. When a young girl comes to the US with her family she notices all the things that are different and the things that are just like home. She misses her old life as she struggles to learn English, make new friends and find her place in the new country. Booklist: "After her family comes to the U.S., a school-age girl describes all of her experiences as 'Not like home' or 'Just like home,' until she feels 'at home.' ...Useful for libraries serving Latino communities with a need for bilingual bibliotherapy on the subject of immigration." The Horn Book Guide : "The child's viewpoint is conveyed through folkloric-style illustrations accompanied by a succinct, lively text in both Spanish and English." Written by Roslyn Bresnick-Perry. Illustrated by Mira Reisberg. Published by Children's Book Press now Lee and Low. Roslyn Bresnick-Perry's true story of her life in a little town on the Russian Polish border shortly before the holocaust. Full of historical details it is a funny bitter-sweet story about immigration, roots and friendship. San Francisco Chronicle "Best Bets of 1992" Selection. Bulletin of the Center for Children's Books: "Reisberg's folksy paintings bordered with homey details enhance the scrapbook flavor of the story, which is finely focused and has the poignancy of memory without the haze of nostalgia." 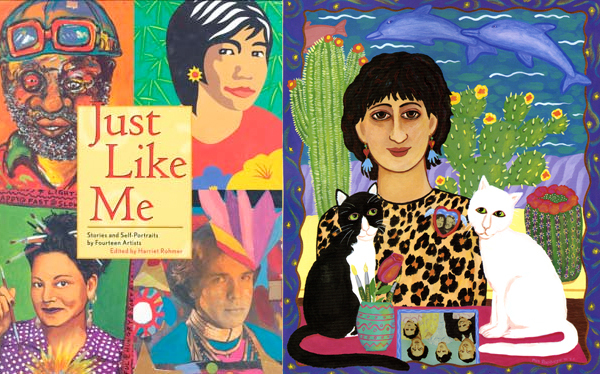 School Library Journal: "Bold detailed paintings in a primitive style feature family members and household scenes surrounded by borders filled with items relating to the text. Reisberg has added a further sense of realism by incorporating small family photographs into several of her illustrations." Hungry Mind Review: "What makes this book shine are the fascinating illustrations by Mira Reisberg - brightly colored family scenes that sometimes fuse real family photos from the author and illustrator's families into the background of the illustrations. Like framed icons, the interior pictures enrich the story being told and often heighten the symbols of the family's life in a manner reminiscent of Chagall. The mixed media presentation is vivid, historically fascinating, and lends a sense of mystery to the family's journey." Moment Magazine: "Reisberg's exuberant painting - collages evoke the era in a style that combines folk art and contemporary design." Small Press Magazine: "Mira Reisberg's bold colorful illustrations incorporate tiny photographs of people and places and are bordered to suggest framed family portraits." Edited by Harriet Rohmer. I'm one of 14 artists who wrote and illustrated this book. Published by Children's Book Press now Lee and Low. This multiracial anthology of 14 artists explores why we are, or became, artists and how we work. In my 2 page spread I included many of the things I love as well as symbols that represent my essence and history: cactus, dolphins, the words "truth, love and beauty" written on my paintbrushes, a family portrait on the table, my cats Guido and Possum, a photo of my husband Guy and I in a heart-shaped pin flying across my fake leopard-print shirt. Five Owls: "The fourteen self-portraits in this book are bright bold, clear and awash with color. they may make you smile or laugh, give you pause, or transport you to another world. Each one is a delight, and together they are mesmerizing." The Bulletin of the Center for Children's Books: "The text is involving and friendly, each individual artist giving a tiny gift of self as they relate his or her "why I make art story"; Mira Reisberg tells how her mother, a holocaust survivor, gave her her first art supplies saying "I can't give you a beautiful world, but you can make one for yourself." Small Press Book Awards Special Review Edition : "These intimate glimpses of the artists and the descriptions of their passions should surely inspire children who read the book to put something of themselves into their own artwork. The artists included represent a complete rainbow of races and cultures from across North America . . . The book is cleverly conceived and elegantly designed, but more importantly it is a book with great heart. Edited by Harriet Rohmer. I'm one of 14 honored artists who wrote and illustrated this book.. Published by Children's Book Press now at Lee and Low. This multiracial anthology of 14 artists takes a fascinating approach to honoring our ancestors and where we come from. In my story I write about spirit ancestors and blood ancestors. Those who came before and helped make me who I am today. My ancestral wall of wonderful relatives includes: my parents, grandparents, the Aborigine people, Albert Einstein, Frida Kahlo, Groucho Marx, Gertrude Stein and Alice B. Toklas, Marc Chagall and Holocaust Resistance fighter and poet Hannah Senesh. As beautiful artist Carl Angel says - it was an honor to be in this book. Kirkus: "Australian born Mira Reisberg's gallery of inspirational figures includes Groucho Marx. Although done in individual styles, the art's crisp lines, bold colors and commonality of feeling creates a visual unity unusual to albums of this sort, a unity reinforced by the artists' unforced, natural-sounding, statements." 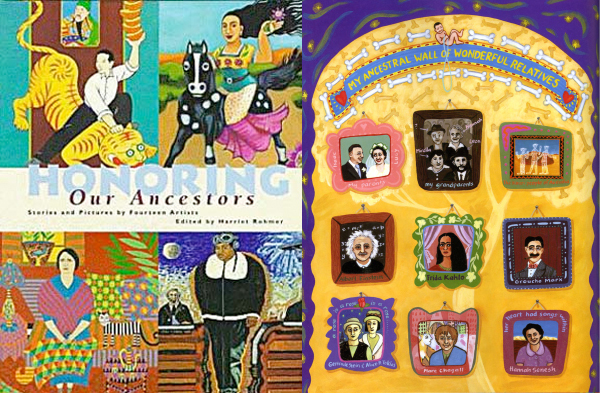 Hungry Mind Review: "Mira Reisberg's family tree or "Ancestral Wall of Wonderful Relatives" includes portraits not only of her parents and grandparents but also of the Kouri (Aboriginal) people from Australia where she grew up, Albert Einstein, Groucho Marx and Hannah Senesh, Jewish poet and Resistance fighter killed in the Holocaust." Booklist: "Mira Reisberg is inspired by her Jewish grandparents, and also by a wide range of artists from Frida Kahlo to Groucho Marx. The pictures are as lively, colorful and diverse as the stories, blending realism, metaphor and memory." Over the years, I have literally visited hundreds of school sharing about my books and life, providing valuable tools and techniques for infusing creativity into everything, and showing ways that children's picture books can be used as a cornerstone for infusing play and pleasure to teach the standards across the curriculum. Other themes include the importance of education and kindness, immigration, paying attention, and why it's important to redo things until they are the very best they can be.